Selected in the sixth round (51st overall) of the 2016 CFL draft and signed on Mar. 9, 2017. (Calgary) Kashak was in uniform as a backup defensive lineman for three games and did not record any stats. 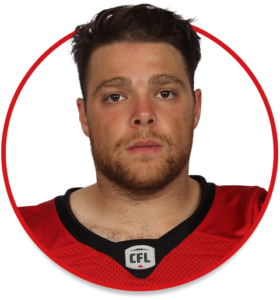 (Calgary) Kashak played six games and had six tackles including two tackles for loss as well as six QB pressures and one fumble recovery. (Calgary) Kashak attended training camp with the Stampeders before returning to university. Kashak was a first-team Canadian and conference all-star at McMaster in 2016 after leading Ontario University Athletics with 11.5 sacks. He also had 29.5 tackles, including 16.5 tackles for loss, and two forced fumbles. Kashak was also a first-team Ontario all-star in 2015 after leading the conference with 8.5 sacks. In 39 career games over five seasons (2012-16) for the Marauders, he accumulated 91.5 tackles including 42.5 tackles for loss, 29 sacks, four forced fumbles and one interception. Kashak topped all defensive linemen in the bench press at the 2016 CFL combine with 25 reps. He is a product of Holy Trinity Catholic Secondary School in Courtice, Ont.